In 1931 Universal unleashed both 'Dracula' and 'Frankenstein', showing that horror films could be both 'A' releases as well as major box office hits. Paramount quickly jumped on the idea by releasing 'Dr. Jekyl and Mr. Hyde' later that same year. This took the other big studios by surprise. MGM didn't enter the foray until much later on. Warner Bros. however, decided to give this horror thing a try. 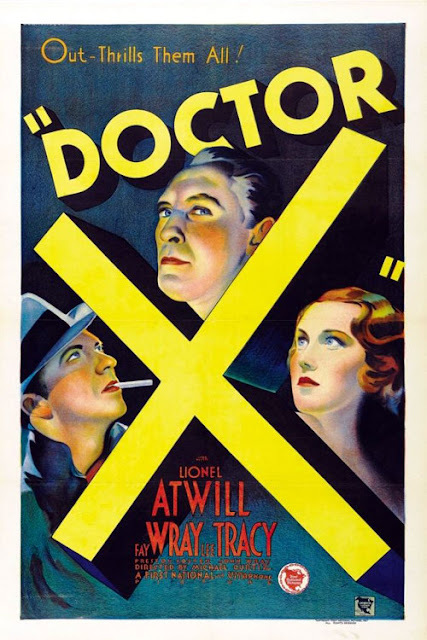 Their first attempt was 'Doctor X', an inversion of the standard whodunit with some surprisingly grotesque concepts. The story; a killer is on the loose, striking only on full moons and canibalizing his victims. Local medical expert, Dr. Xavier (Lionel Atwil) is called in to examine the latest victim and believes the 'Full Moon Canibal Killer' to be one of his colleagues. He is given 48 hours to solve the crime before the police move in. Moving quickly, Xavier wisks away his colleagues as well as his daughter (Fay Wray) to his decidedly creepy Long Island estate where he will conduct some unique experiments that he hopes will uncover the murderer. Along for the ride is wisecracking goofball, Lee Taylor (Lee Tracy) who is himself determined to get to the bottom of things. Although it was clear that Warner was not ready to move away from it's tried and true Old Drak House routine, it does at least try to add a few surprises along the way. The very idea of the murderer also being a cannibal was quite a unique, shocking and repulsive concept for 1932 Hollywood and even though nothing is actually shown, it's very suggestion must have been enough to cause much audience unease back then. As is customary with this type of story, the killer initially would seem to be supernatural, only to be revealed as human at the climax (the, "let's see who our monster REALLY is" concept that Scooby Doo would paraphrase time and time again). The inversion here is that the cannibal killer is presumed to be human all along until it's over the top climax where something far more monstrous is revealed. That would be in the form of Dr. Wells (Preston Foster) whom the scrpt had gone out of it's way to clear as it's killer (laughably so to the extent where only the densest of theater goers wouldn't figure it out immediately). The 'synthetic flesh' payoff easily makes up for the creaky goings on that preceeded it and is one of the more macabre sequences in '30s cinema. Lee Tracy was given the dual role as comic relief and ultimately the hero. It was an unusaual move and one that caused much audience and crtical praise at the time. Seen now, his character comes off as distracting and occasionally grating. Lionel Atwil would soon go on to become one of horror's more dependable villians. Here he shows that he can play a sympathetic scientist just as well as the mad variety. He's an asset to anything he appears in. The truly breakout performance (at least in hindsight) belongs to Fay Wray. This being her first horror appearance, she was given a somewhat meatier role than what I became accustomed to seeing and found this to be one of her more enjoyable perfs. Though relegated to 'damsel in distress' mode, she also played it tough when necessary, holding a gun at Tracy early on and then (and most memorably) seducing him into staying for the night when it was feared he'd leave and tell the newspapres what was going on. All in all, 'Doctor X' will not be confused with the greats of the classic horror cycle, but it is an interesting early experiment. Yes, the storytelling leaves something to be desired and Lee Tracy's character has not aged well, but it is spooky and atmospheric (shot in early two-toned Technicolor), features a memorable Fay Wray and of course, synthetic flesh!